Bookeen has released its second generation Cybook Odyssey e-reader and has incorporated a front lite technology and a high resolution display. How does this rank up against the other popular brands out there like the Kindle Paperwhite and Kobo Glo? During this comprehensive hands on review, we will evaluate all of the features this European reader brings to the table. The Cybook Odyssey HD features a six inch capacitive touchscreen display with a resolution of 1024×758 pixels. It uses the same type of XGA technology found on the Kobo Glo and Kindle Paperwhite. Underneath the hood is an 800 MHZ Texas Instruments Cortex A8 processor and 128 MB of RAM. 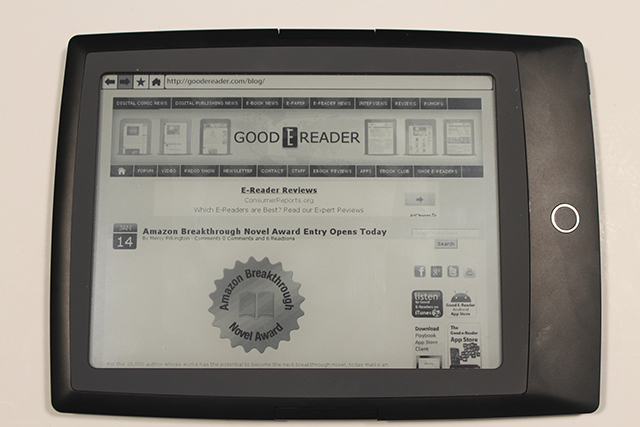 The hardware is perfectly adequate for an e-reader and navigating the menu and opening books occurs very quickly. You will have 2 GB of internal storage for all of your ebooks, and you can enhance it further via the Micro SD for up to 32 GB of additional memory. Battery life is also very solid with the 1600 mAh, which will normally provide up to a month of battery life. If you tend not to use the front light very much, you should be able to have it last a little bit longer. One of the ways this device conserves battery life is the automatic disabling of wireless internet access when you leave your reader idle. You can charge it via the accompanied Micro USB cable by plugging it into your computer. The Cybook Odyssey HD has a very unique design that is a departure from the standard cookie cutter readers that are prevalent in today’s climate. It has rounded edges and little angle grooves that allow you to hold it in one hand very easily. There is a home button on the front screen and manual page-turn buttons. Honestly, I love e-readers that are touchscreen but still have buttons to give you a tectonic feel and a higher degree of interactivity. A single press will call up the menus and a double tap will turn on the front light. Front Lite technology is still rather new and there are only a few models that are currently on the market. The essence of this front lite screen gives you the ability to read in the dark or under low-light conditions. In the past, you needed ambient light or a book-light in order to read in the dark. I found the light in the Bookeen model does not give you the pure white screen that the Kindle Paperwhite provides, but is a little bit better than the Kobo Glo. The Cybook Odyssey HD is running on a Linux operating system and uses Bookeen’s HSIS scrolling technology. This is quite evident in browsing the internet and looking at PDF Files. You get these little directional arrows that let you know you can scroll in four different directions. This helps you orientate where exactly you are in any given document, which is fairly intuitive. The main home screen is where you will find yourself the most often by clicking on the home button or exiting a book. It shows you the last five books you are reading and you can scroll your entire library by gesturing left and right. There is a bookstore on the very bottom that can actually be customized by the company you purchased it from. By default it is dealing with the Bookeen eBookstore, but you can get them to tie it into whatever free source of paid or free ebooks that you want to. One of the coolest elements of this e-reader is the inertia in the way you can switch the orientation from landscape to portrait mode. The Odyssey HD allows you to scroll quite easily when you are accessing menus, and by gesturing downwards, it will actually scroll very quickly. This is easy for changing your fonts or setting up the sweet spots in PDF with different zoom levels. The other cool part is being able to hold two finders down and twist them to the left or right. This is how you accomplish switching the orientation because it does not have a built in gyroscope or accelerometer. If you live internationally and want to buy an e-reader with tons of different language options, the Odyssey HD does not disappoint. It has language support for over 21 different countries, such as Dutch, English, French, Spanish, Italian, Chinese, Turkish, German, and many more! Bookeen is based in Paris France, so they tend to know a thing or two about the different languages in Europe. 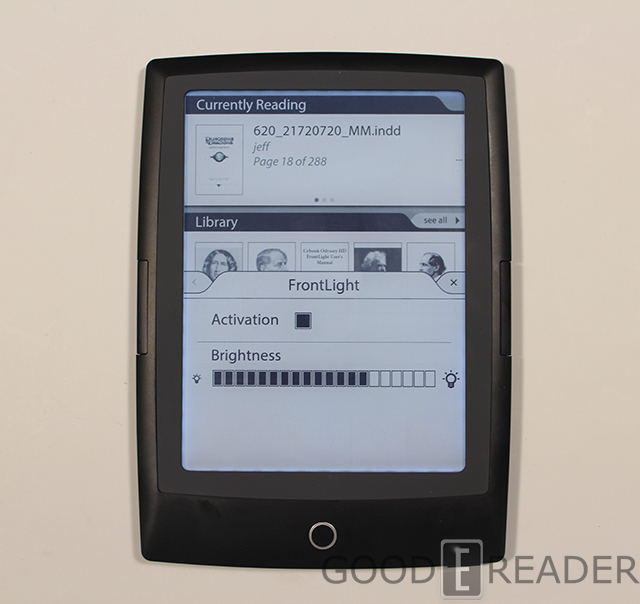 Finally, if you have ever bought an e-reader before, you will know all about firmware updates. These normally produce enhancements and new features and sometimes can be arduous in setting up. Many of the most popular brands slowly push out the firmware and often warrants you to put it on an SD card and load it in manually. This device has automatic firmware downloads done OTA. As long as you have a WIFI connection, you can get a quick update. Bookeen has confirmed with us they have a new patch in development and will be issuing it soon. When you open a book for the first time on this dandy little reader, you will see cover art that starts in the background and slowly moves into the foreground in one fluid motion. The cover art has a twist that immediately captivates you with a unique experience. This reader currently will read EPUB, PDF, Adobe DRM, HTML, TXT, FB2 eBook formats. Book reading is very pleasant with the HD model and you will find it very easy on the eyes in true e-ink fashion. If you are not a fan of the default font, you can easily select from 18 different font sizes to find your personal sweet spot. When you select a new font, you get a visual cue on what it will look like by the way the font sizes increase as you scroll down. When you find one you like, all of the text within your ebook is dynamically updated in real time. Many other readers need you to exit the menu to refresh the screen. Not only can you adjust the font size, but the font type is selectable too. There are around 10 different pre-loaded fonts types to choose from and they are ideal to mess around with if you have your own particular favorite. If you plug the Cybook HD into your PC, you can load in your own fonts! 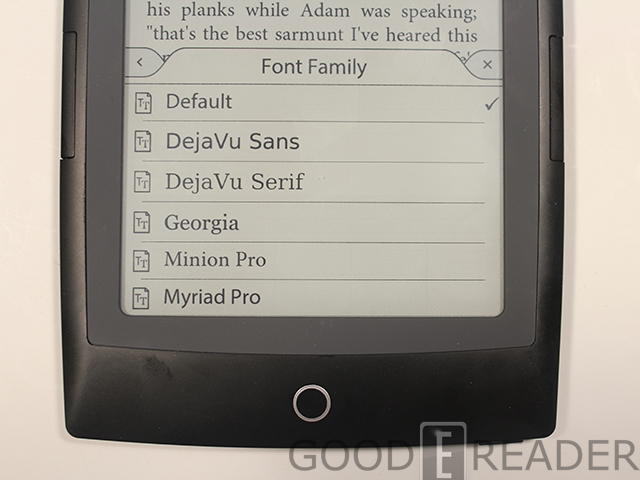 We have reviewed hundreds of digital readers over the years and seldom do we encounter a non-Kobo model that lets you load in your own fonts. This opens up a world of opportunity to load in your favorites or even foreign language ones with different ways to display characters. Most touchscreen e-readers allow you to hold down on a specific word to make a highlight, take notes, or mark an annotation. Instead of doing it the traditional way, Bookeen has added another sub-menu to initiate these features. I honestly like it this way! I have found with other touchscreen models that when you are turning pages you will often accidentally tap on word and bring up a bunch of editing options. This model negates the clicks you might make and always turns the page properly. One interesting thing we found out is if you swipe to turn the page, you will get an instant full page refresh. If you tap on the left or right hand side, you will get a seamless transition and will experience a full page refresh every six pages. If you hold downwards on one of the margins, you will very quickly scroll throughout the book. The Cybook Odyssey HD really gives you a great PDF experience that puts the Sony PRS-T1 and T2 to shame. You have 20 different levels of zoom to really find that sweet spot in whatever document you are reading, and it takes into account how heavy the images are. You can tap on fit to screen, height, or width depending on what orientation you are reading the PDF on. In many cases your user manual or technical document may not be that readable and in this case you can strip away all the custom styling sheets and get a pure ebook experience. You can turn Reflow on and it disregards all of the images and just gives you the text. Tweaking with the zoom levels when you have Reflow enabled really allows you maximum flexibility. Finally, there is no way to really organize your collections properly into different folders, but it does have some great searching options. You can refine your library view by Genre, Tags, Author, Publisher, and other facets. This makes managing large collections a little bit more viable. If you are looking for a quick, stable, and robust e-reader with a heavy emphasis on internal support, take a look at this model. Bookeen has been a company that has been floating under the radar for a long time, but the company heavily invests in research and development. They continue to find new ways to stand out from the competition and bring an interesting hardware design to the table and new software features like inertia and a great internet experience. When it comes down to it, one of the features that really stands out is the front light technology. It allows you to read in the dark and not be dependent on ambient light or third party accessories. It may not be as good as the Kindle Paperwhite, but it does put the Kobo Glo and Nook Simple Touch with Glowlight to shame. I would recommend this reader if you are looking to separate yourself from the herd or if you are always reading PDF documents. If you have had a prior reader, it may take a bit of time before you adjust to the unique ways this reader handles itself. Don’t like page refresh flashes? Disable them completely! For me, this was the device that could have been a great contender to the T2. While I liked a lot about it, the web browser was such a let down that I ended up returning it. With a better and fast browser, cookie support and a cursor, it would have been a great reader for direct access to library books. Also, when you first turn the device on, there is no light and yo nhave to fimble through the onscreen menu, click “activate light”, then select how bright you want the light to be: utterly useless in complete darkness or low lighting situations. NO, if you would have read the review, you would know that you can switch on the light simply with the ‘home’ button. No menues involved! 1) Is it true that there is no English dictionary? I conclude this from the company’s web site, although they don’t quite come out and say it. 2) I’m suspicious of the rounded edges. I have another device with a similar design; it takes a lot more finger strength to hold than does my square Sony. That one is uncomfortable to hold for long periods, and difficult to hold at all with one hand. Is the cybook like this? *** you CAN use dictionnaries: but you have to download and install. – you cannot choose a dictionnary for a given book, the dictionary will be selected depending on the language defined in the meta-data of your book. If your book’s language is incorrectly defined (english instead of italian for instance) you can update your book using Calibre. – dictionnaries are not hypertext: you cannot jump from word to word in the dictionnary entry. * there IS A way to really organize your collections properly into different folders BUT you need to connect to your personnal computer. reader will be shown as a usb storage: you can organize the way you want with the explorer (or use calibre). On the reader, you will have to use the ‘folder’ view. just use the “folder” view on the reader. to store in folder just connect the reader to your computer, it will be shown as a usb storage. * PDF reading missing a feature: you cannot scoll in a page by swiping the screen. you have to hit the small arrow button on the screen. I real life this is not an issue for books, but would be nice for PDF newspapers. * format: note that CBR/CBZ format is not supported: manga afficionados should go for Kobo. * bugs: while reading ~5000 pages on this device, it froze twice, while quickly scrolling a book. solution: reset. reset is done by pushing 8 seconds on the power on button. * firmware update: one in the last 3 month. * battery endurance (when using the light and wifi being off) is over 2000 pages for “simple” books (scifi, fantasy, roman; would be less pages reading Hegel I presume…). 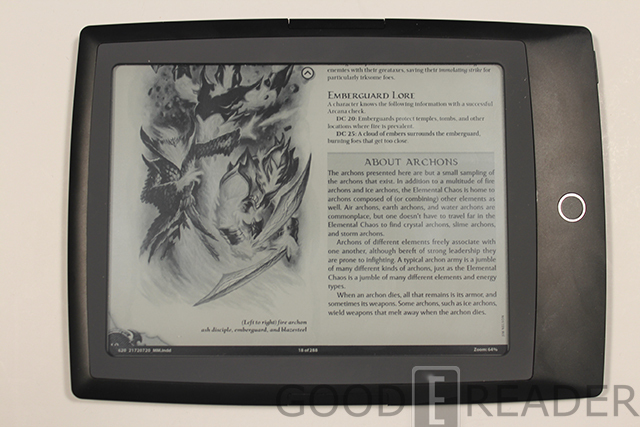 have anyone tested how does this ereader handle displaying code? Does anyone know if the Odyssey HD handles book collections within its interface? The info I’m getting is that once on the device, options are very limited in that you can search by Author, Title, and a few other almost useless ones including book size. I’m looking to replace my Sony PRS-600 because I want a front lit model and this might fit the bill but since a large segment of my library are book collections I need a reader with this capability on-board.